LONDON, UK, July 29, 2016 (ENS) – Today, 45 nongovernmental organizations from around the world are raising the alarm over increasing tiger poaching and calling for an end to all tiger farming and trade in tigers and their body parts. Commercial trade in tigers has been illegal since 1975 under the Convention on International Trade in Endangered Species, CITES, but it continues nevertheless. As a result, wild tigers are still disappearing. The NGOs timed their warning for today as it is International Tiger Day, also called Global Tiger Day, observed annually on July 29. A hundred years ago there were an estimated 100,000 wild tigers that lived in central Asia and from the eastern coast of Russia down through most of east, southeast and southern Asia. The Red List of Threatened Species compiled by the International Union for the Conservation of Nature, IUCN, lists tigers as Endangered, with just over 2,500 estimated to remain in the wild, down from 5,000 to 7,000 in 1998. The United Nations Environment Programme, UNEP, Regional Office for Asia and the Pacific today marked International Tiger Day with a call for urgent action to protect tigers and combat illegal trade in wildlife. UNEP is urging zero tolerance for wildlife crime as part of its 2016 Wild for Life campaign, which aims to mobilize millions of people around the world to take personal action to end the illegal trade in wildlife. “Today, as we mark the International Tiger Day, the United Nations is calling on everyone to stop wildlife trafficking, through the Wild for Life campaign,” said Isabelle Louis, acting regional director, UNEP Regional Office for Asia and the Pacific. The threat posed by illegal tiger trade was shown by the discovery of 70 dead tiger cubs, tiger skins, talismans and other wildlife parts in a Buddhist temple in Thailand in June. The 45 NGOs praised Thai officials for uncovering tiger trade activities at the temple. “We commend the recent bold enforcement efforts of Thailand’s Department of National Parks, Wildlife and Plant Conservation (DNP), which in June 2016 seized 137 live tigers, thousands of tiger skin amulets, 70 preserved cubs and other tiger parts from the ‘Tiger Temple’ in Kanchanaburi Province,” the NGOs said in a joint statement. 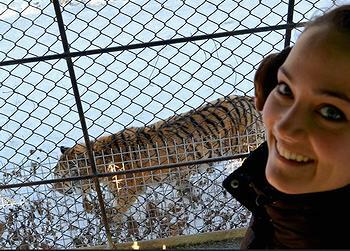 “The DNP has announced that it will investigate other captive tiger facilities implicated in tiger trade. This represents a significant opportunity for Thailand to end all tiger farming within its borders and to play a leadership role in the phase-out of tiger farms in the region,” the NGOs urged. There are international efforts to restore tiger populations in the wild. There are some bright spots on the tiger restoration landscape. At the 10th session of the Sino-Russian Working Group on transboundary protected areas and biodiversity conservation July 5-6 in Vladivostok, Russian ecologist Dr. Yury Darman, director of WWF-Russia Amur branch, briefed delegates on the results of the 2015 Amur tiger census. The census data showed that over the last decade the tiger population increased by 15 percent and has reached 540 individuals, Darman said. And in Kazakhstan, plans are underway to restore tigers to a landscape they inhabited as late as the 1940s – the vast wetland of the Ili River Delta. Existing tiger habitat covers about 10,000 km2 in the Ili Delta and along the southern shore of Lake Balkhash, about half of which is protected areas, wrote Susan Lumpkin of the Global Tiger Initiative, who flew over the area in 2014. 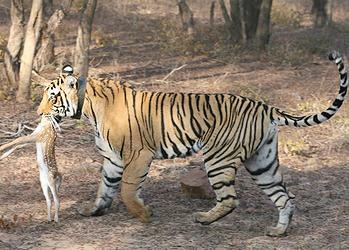 India, which has more wild tigers than another other country, celebrated International Tiger Day by urging tourists to visit India to see the rare animals. India has 2,226 tigers, about 70 percent of all the world’s wild tigers, spread across 17 states and 49 sanctuaries. Dave emphasized that India is contributing “significantly” towards achieving the St. Petersburg target of doubling the tiger population by 2022. Later, the minister flagged off the Walk for the Tiger, which was organized in collaboration with India’s Wildlife Crime Control Bureau, the Global Tiger Forum, WWF-India, the Wildlife Trust of India, TRAFFIC, Kids for Tigers and Aircel.